Burial societies among Moroccan Jews were a corner stone of community organization and mutual support. Their members were volunteers who contributed to the community of their time and financial means and much more, they strengthened their communities in trying moments, in times of sickness and death. Burial societies also managed cemeteries, many remarkable in their esthetic design, exceptional monuments in unexpected places and a testimony to a rich community life in difficult and at times hostile environment. The Fez Jewish cemetery illustrating this paper may seem unique in its magnificence but in reality, it is only representative of other cemeteries in Jewish Morocco. Burial societies among Moroccan Jews were a corner stone of community organization and mutual support. Their members were volunteers who contributed to the community time and financial means and much more, they strengthened their communities in trying moments, in times of sickness and death. Burial societies operated under a variety of names such as �Hevra Kadisha� or in short �Hevra� (society),� �Hevrat Rabbi Shimo�n Bar Yohay� or in short �Hevrat Rabbi Shimo�n� when abbreviated, �Hevrat Gomley Hassadim� (Society of Mutual Assistance) or �Hevrat Hessed ve Emet� (Society of charity and Truth). Membership in burial societies was based on voluntary participation and was rarely remunerated, although donations were common and usually intended for charitable purposes to benefit the needy rather than the burial society or its members. Furthermore, members often made significant contributions in funds to their societies in addition to volunteering their time. Contribution to burial societies activities was considered an honor and a sacred duty and their volunteers were highly respected. Volunteers tended to be older people with experience who did their work with great humility. Some were ordinary people with little education or low levels of theological literacy but the key organizers tended to be well versed in burial ritual practices and a few among them shared cross-membership in �Zohar Societies� (Book of Splendor Study groups) because of the tradition of Zohar readings during the seven days of mourning. Burial societies were organized according to a multi-functional division of labor as discussed below. Members of the burial societies kept a low profile in the community and performed their duties with pronounced modesty and most humble among them were the members of the Linat Zedek chapter. Modesty was required for a variety of reason. The principal reason is likely to be related to practices of avoidance. Community members at large tended to understate membership in burial societies to minimize discussions relating to death, bad news or bad news bearers. And although people knew that certain people were members of burial societies, they did not relate to them on the basis of burial related activities but as people involved in sacred activities. 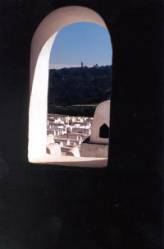 For this reason, burial societies were called �Hevra� (society) rather than �Hevra Kadisha� which insinuates burial activities. But there was another important reason for underplaying the important voluntary work members of burial societies did, their work was intended to be fulfilled without any sort of earthly compensation or recognition. It was done for heaven�s sake. Furthermore, some of the burial societies members held membership in �Zohar� study groups and adepts of Zoharic thinking were bound to live in humility. 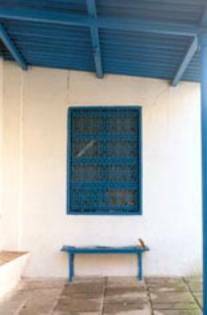 This last trait is an underlying characteristic of learned people in Jewish Morocco, symbolized and represented most strongly by Rabbi Yaa�cov AviHatsira and his followers (interviews with Mordekhay, Sarah and Joseph El Hay Ani). Members of burial societies visited the ill (Bikur Kholim chapter) and critically ill (Linat Zedek chapter) on a regular basis to provide comfort to them and their families. As visiting the ill and the critically ill especially was a taxing emotional activity, members of burial societies took turns in visitation duties. There was also a distinction between ordinary visiting of the ill and extraordinary visiting of the critically ill. Visiting the critically ill was reserved to experienced members of the burial societies who had the distinct role of watching a dying person in his or her final moments in order to facilitate a last confession (�vidouy�) (see discussion below). Here too, practices of avoidance were in full effect. Members of the chapters of the burial societies visiting the critically ill (Linat Zedek members) made every effort to keep a distance from the critically ill in order not to alarm the ill person or his/her family and in order to prevent the association of their presence with death� (interviews with Mordekhay, Sarah and Joseph El Hay Ani). Often, when families appeared to be in need, burial societies provided economic assistance. Here too, the assistance was provided surreptitiously to save the receiver from �loosing face� but also to fulfill the tradition that help is to be given in humility �for heaven�s sake� and not for earthly gains. 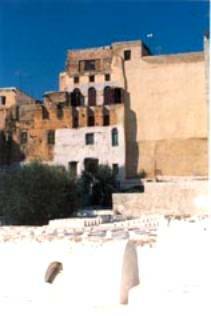 In some cases, for example in Fez, burial societies also assisted people in need to celebrate weddings adequately (interview with Jacob Dahan, July 2002). Although involvement of burial societies in weddings may seem a straightforward charitable act, it carries a loaded underlying symbolism. It is commonly known, for example, that Jews break a glass immediately following the exchange of marriage vows. This tradition was adopted following the destruction of the Second Temple to remember its destruction even in conjunction with happy moments in Jewish life. Here, according to some, facilitating marriages by burial societies has a reverse function. It is intended to mitigate the burial societies involvement in death, a destructive activity attributed to the angel of death. Other chapters of burial societies were involved in other charitable activities, i.e., Hevrat Eliahu discussed below (interviews with Mordekhay, Sarah and Joseph El Hay Ani). Some members of the burial societies had the distinct role of watching a dying person in his or her final moments in order to assist them in reaffirming their devotion to the God of Israel, i.e., �Listen oh Israel, our Lord is our God, our Lord is One.� This reaffirmation, often called� �vidouy� (confession) was considered of major significance to ensure proper separation between life and death and was required to prevent the erring of the soul between earth and heaven after death. A proper confession offered the dying person a departure from the world of the living in peace and members of the Linat Zedek chapter of the burial societies played an important role in ensuring it (David Ovadia, Kehilat Sefrou). According to Jewish mourning practices, a mourning person is required to rend his or her garment to mark his or her mourning of the death of an immediate relative (a brother, a sister, a father or a mother). The person who witnesses the death first tears his or her garment and then proceeds to tear the garments of the immediate relatives of the dead person. Often, the eldest person in the family, usually a male, is the person who rends the garment. Members of the Linat Zedek chapter of the burial societies were also required to rend their garment because they tended to be the first to confirm the death of a person in conjunction with the recitation of the final confession as described above. This practice is consistent with a rabbinical edict, as stated by Joseph Caro in his much-followed �Shulkhan Arukh� (see Joseph Caro �Shulkhan Arukh� Yoreh Derekh, III: 340:5). Some members of the burial societies had the distinct role of cleansing the body of the dead in preparation for burial. These members belonged to a chapter of the burial society known as Hevrat Rohazim or the cleansers society. In Morocco, it was very likely that the body was cleansed in the home of the deceased person but cleansing was also performed in chapels in some cemeteries. Women members cleansed women�s bodies while men members cleansed men�s bodies. Once a body was cleansed, it was wrapped in �takhrikhim� plain linen shrouds prepared by members of the cleansing society, although it was not uncommon for people to have their own shrouds prepared before dying (interview with Sarah and Esther El Hay Ani). Bodies of deceased persons were carried from one place to another by selected members of the burial societies: members of Hevrat Hanosiim chapter. These volunteers carried bodies from the home to cleansing chapel when needed, or from a hospital or other places of death to the home where cleansing was to take place and finally from the home of mourning to a cemetery and often to a grave too (interviews with Mordekhay, Sarah and Joseph El Hay Ani). Grave digging was considered a difficult task as sacred as it may have been considered and members took turns in carrying this duty. Often selected members of burial societies form a chapter dedicated for to the purpose of grave digging. It was a practice to have a couple of graves ready for late day, Shabbat or holiday eve burial, since burial is to take place before dark and digging is forbidden on holidays. Some members of burial societies belonged to a distinct chapter known as Hevrat Eliahu (Elijah Society) or Hevrat Halevaya (the funeral society). These members fulfilled the same function, i.e., informing the community as to recent deaths to ensure adequate funeral attendance. Attendance in funerals was considered a good deed. It was an opportunity for the community to display solidarity even in light of outstanding conflicts. Community members attend funerals to demonstrate support to families in mourning, thus providing much needed emotional comfort in times of hardship. 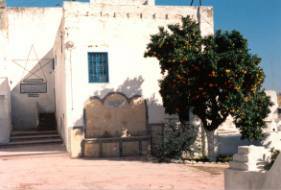 Funerals are generally well attended in Moroccan Jewish communities and it is not uncommon for people to travel long distances to attend funerals as well as subsequent mourning and commemoration events. As discussed earlier, burial societies were often involved in charitable activities. The Elijah Society was especially known to do so. Elijah Society provided assistance to families in need in times of circumcisions, weddings and holidays. The assistance was provided surreptitiously to save the receiver from �loosing face� but also to fulfill the tradition that help is to be given in humility �for heaven�s sake� and not for earthly gains. Here again, charitable activities were intended to mitigate the burial societies involvement in death, a destructive activity attributed to the Angel of Death and the Primal Chaos. In addition, members of Elijah Society were involved in conflict resolution aiming to bring feuding parties together in order to increase harmony on the face of the earth and under the heavens. For according to the Book of Splendor (Zohar), harmony is one of the prerequisites to the completion of Creation. For in the primal process of Creation, broken pieces scattered (primal chaos) and Man (i.e., Adam and Eve and their descendents) was created to assemble them. And assembling the broken pieces is the process through which Man becomes like God, a creator and partner in the completion of Creation (interviews with Mordekhay El Hay Ani based on the teachings of Rabbi Ya�acov AviHatsira, see for example: Manor, Dan: Kabbale et Ethique au Maroc, La voie de Rabbi Jacob Abihatsira Hebrew edition). Hessed ve Emet, another chapter of burial societies of Moroccan Jews, undertook the maintenance of cemeteries. Cemeteries were well planned and very well maintained. 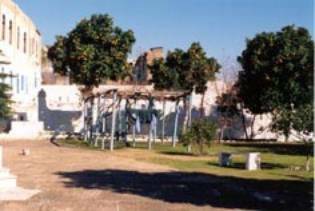 In this paper, the Fez cemetery is described to provide an illustration. The city of Fes, founded in 789 by Berbers on the banks of the river Fes, was made into a capital by King Idris I (789-793) and developed by his son Idris II (804-828), attracting many Arabs from Andalousia and Kerouan, among them many Jews. 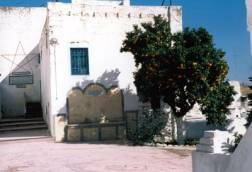 The Jews established a Jewish quarter (Fundunk al Yahudi or Melah) and contributed to turning Fes into a leading business center in Morocco. 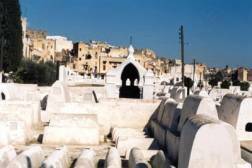 As the city developed many learned men settled in Fes, among them such as Yehuda Ben Qurayesh, David ben Abraham Alfassi and Maimonides (1150) as well as businessmen and community leaders such as Nahman ben Sunbal (1556), Samuel Hagiz (1596), Yehuda U�ziel (1603), Shemouel Tsarfaty (1713), Yehuda Ben Atar and Hayim Ben Atar, Avner Tsarfaty (1884) and Isaac ben Danan (1900). to a second entrance or the Melah entrance. At the Melah entrance, there was a school (now used as a museum). �In some sections, it is still possible to see vestiges of the old wall as well as the layers of construction of housing level upon level as the Melah evolved. There are sections for children, adults, priests (cohanim) and people of distinction. Both are considered saints and are subject to ongoing as well as annual pilgrimage. 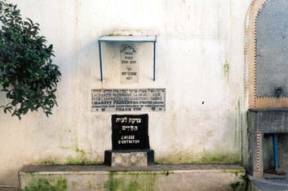 Burried nearby are Rabbi Avner Hatsarfati (the French) and Rabbi Haim Cohen and Rabbi Yaacov Even Tsur. Most tombs are unmarked but some do have modest tombstones with Hebrew writing. More recent tombs have also French inscriptions. 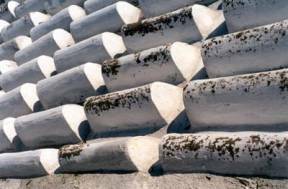 Most old tombs are made of cement, painted over in white. 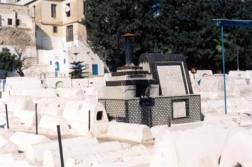 A few tombs belonging to community leaders and built in recent decades are cubic in shape and covered in marble. 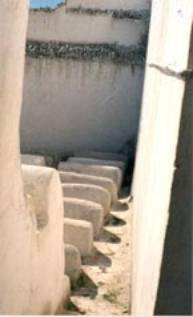 Some of the tombs belonging to priests (cohanim) lie separately, below the wall of the school on the edge of the cemetery. Most are also cubic in shape and carry inscriptions on a rectangular piece of stone or marble. Burial societies also managed cemeteries, many remarkable in their esthetic design, exceptional monuments in unexpected places, a testimony to a rich community life in difficult and at times hostile environment. The Fez Jewish cemetery illustrating this paper may seem unique in its magnificence but in reality, it is only representative of other cemeteries in Jewish Morocco.